You may be driving along the highway and see a field of yellow, white and pink asters just growing wildly in the middle of nowhere. Actually, these are the Northern Hemisphere native Boltonia, which can be found across the mid to eastern United States. Also called false aster (Boltonia asteroides), this perennial flower produces ray-like flowers surrounding a yellow center. The cheery flowers last well into early fall and grow well in sandy or gravely moist areas. Boltonia plants are characterized by their attractive flowers and large bushy habit. They can grow 3 to 6 feet tall with a spread of up to 4 feet in width. False aster Boltonia is a perennial which prefers dry soil in full sun but can grow in partially shaded areas. Plants in lower light tend to get rangy and may require staking. The blooms start appearing in mid-summer and last well into early frost periods. The plants grow well in temperate zones and the flowers attract butterflies and small pollinators. The flowers lend the plant the name white doll’s daisy and bring bright fall tones to the late season garden. The ideal USDA plant hardiness zones for Boltonia plants are zones 4 to 9. The perennial has a habit of naturalizing through seed in clay or excessively moist soils. It forms a lovely bush, which can be divided every few years to make new plants. For the best performance, choose a sunny, well-drained (but moist) soil when planting false aster. Established Boltonia plants can tolerate drought but they don’t bloom as prolifically and foliage tends to wither. Newly installed plants require supplemental moisture as they mature. False aster Boltonia grows best when soil is amended with compost and they are not allowed to dry out for more than a day. Start seeds indoors at least six weeks before the date of the last frost. Transplant them outside after a period of hardening off, into a well tilled bed in full sun. These herbaceous perennials are easy to care for and have low maintenance requirements. The flowers make excellent cut blooms and last in a vase for up to a week. Change the water frequently and freshly cut stems daily as part of cut Boltonia flower care. This will help the flowers to last longer. 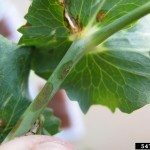 There are few pest or disease problems with the plant. This hardy little flower is even deer resistant and makes an ideal addition to the native wildflower garden. To improve the appearance of the bush and increase the density of the plant, cut back the dead foliage in late winter to early spring. Watch out for the sticker seed heads if you don’t want the plant to spread. These are easily dealt with by pruning them off in late fall. False aster Boltonia is an excellent producer with a long life and sunny daisy-like end of season flowers just as the rest of the garden is going to sleep for winter. Read more articles about False Aster.